Chef Marcus Samuelsson attends New York Magazine's annual "Taste Of New York" in 2007. The President needed an expert on vegetarian food, so he called in a Scandinavian chef from New York City. President Obama and First Lady Michelle hosted their first state dinner Tuesday night in honor of India's Prime Minister Manmohan Singh. Normally, the White House staff would dish up any dinner with no problem. But Singh is a vegetarian, and the Obamas needed a pro to put together a proper menu. That's where the Swiss chef Marcus Samuelsson comes in. 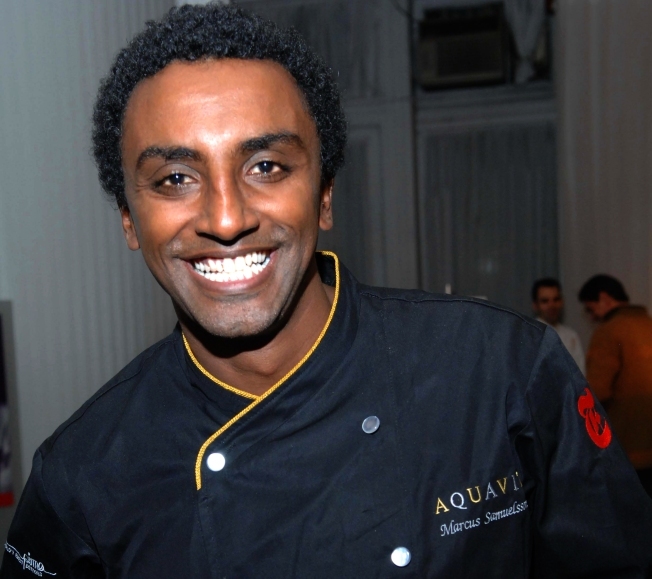 The Ethiopian-born Samuelsson is an award-winning chef at Aquavit Restaurant New York. The chic eatery opened in 1987 and calls itself "the premier Scandinavian dining destination in Midtown Manhattan. Tuesday night, Samuelsson lent his talents to create a veggie-heavy menu. Guests got to choose from potato and eggplant salad, arugula from the White House garden, red lentil soup and roasted potato dumplings or green curry prawns. Pumpkin was served, too, of course, as the dinner took place only two days before Thanksgiving: Specifically, pumpkin pie tart and pear tatin with whipped cream and caramel sauce made up the dessert; the pears were poached in honey from the White House beehive. Samuelsson and the staff whipped up enough food to serve all 338 guests. All of it was served under a big, white tent on the south lawn of the White House. Guests sat in groups of 10 at round tables draped in green apple-colored cloths and napkins, all offset by the sparkle of gold-colored flatware and china, including service and dinner plates from the Eisenhower, Clinton and George W. Bush settings. Floral centerpieces of hydrangeas, roses and sweet peas in plum, purple and fuchsia evoked India's state bird, the peacock.